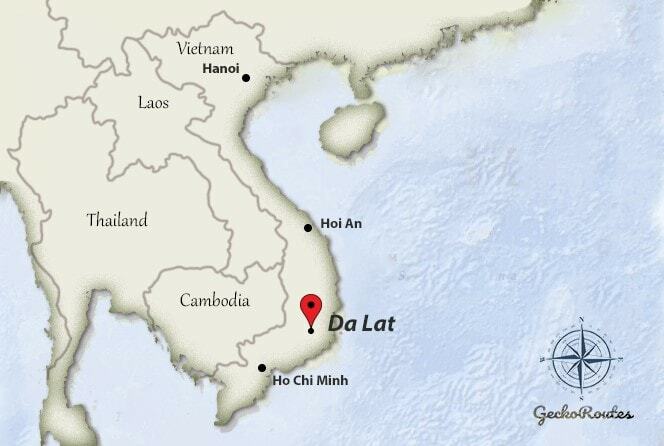 DaLat airport is named ‘Lien Khuong International Airport’ and is located 30km south from DaLat city center. A taxi from DaLat airport to the center costs only around 200.000 VND (7,50). Alternatively, you can book a shuttle bus which brings you to the center of DaLat. You can buy your tickets in the arrival hall of the airport. You can order a taxi to and from DaLat city center from 200.000 VND (€8). They will likely try to charge you more, so better practice your negotiation skills! You can book a shuttle bus at the ticket booth in the arrival hall of the airport. Tickets cost 40.000 VND (€1,50) and the ride takes about 45 minutes. The bus drops you off at Ngoc Phat Hotel or at your hotel when it’s on the route. But, always ask where the bus will drop you off exactly. There are some reports that they drop you off at the edge of the center so you still have to take another taxi to your hotel. When you want to travel to the airport ask your hotel or visit a local agency in DaLat to book your shuttle bus. At Redhouse Backpacker Hostel you will easily meet many fellow travellers. Make new friends during breakfast or the (free) BBQ and explore the city of DaLat together! Dorm-beds costs less than €5 and even include free buffet breakfast! Want to enjoy the romantic city of DaLat while staying in the city center? Doc May Boutique Villa is located in the center of DaLat and surrounded by many nice restaurants. From €29 you get a double room with excellent breakfast and very comfy beds! This Villa is great home from where you can easily explore the surroundings of DaLat. They have a map with points of interests and can arrange a scooter to explore all these places on your own. Rooms with mountain view start from €36. Enjoy the great views while having a delicious breakfast served to your room!